This article is about one of the sacraments of the Catholic Church. 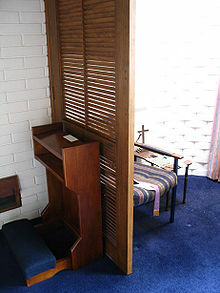 For confession in other religions, see Confession (disambiguation). For penance in other religions, see Penance. For reconciliation in other religions, see Reconciliation (theology). ^ a b c d e f g h i j One or more of the preceding sentences incorporates text from a publication now in the public domain: Hanna, Edward (1911). "The Sacrament of Penance" . In Herbermann, Charles. Catholic Encyclopedia. 11. New York: Robert Appleton. ^ a b c One or more of the preceding sentences incorporates text from a publication now in the public domain: Leclercq, Henri (1910). "Fourth Lateran Council (1215)" . In Herbermann, Charles. Catholic Encyclopedia. 9. New York: Robert Appleton. ^ Sacred Congregation of the Holy Office (2002). "Decree condemning certain errors of the modernists: Lamentabili sane". In Bechard, Dean P. The Scripture documents: an anthology of official Catholic teachings. Translated by Bechard, Dean P. Collegeville, MN: Liturgical Press. p. 186. ISBN 0-8146-2591-6. Rahner, Karl (1969). "Penance". In Rahner, Karl; Darlapp, Adolf; Ernst, Cornelius; Smyth, Kevin. Sacramentum mundi: an encyclopedia of theology. 4. New York [u.a. ]: Herder and Herder. pp. 385–399. OCLC 21568. The Shepherd was very popular amongst Christians in the 2nd and 3rd centuries. 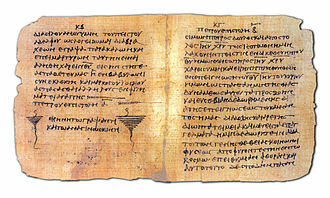 It was bound as part of the New Testament in the Codex Sinaiticus, the work comprises five visions, twelve mandates, and ten parables. It relies on allegory and pays attention to the Church. 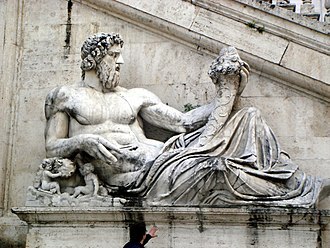 The book was written in Rome, in the Greek language, but a first Latin translation. 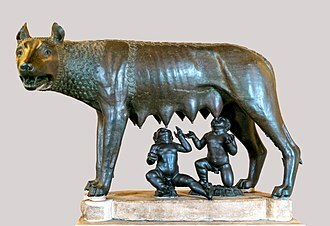 A second Latin translation, the Palatina, was made at the beginning of the fifth century, of the Greek version the last fifth or so is missing. The shepherd is one of the meanings that was attached to some figurines of the Good Shepherd as well as a symbol for Christ. The book consists of five visions granted to Hermas, a former slave and this is followed by twelve mandates or commandments, and ten similitudes, or parables. It commences abruptly in the first person, He who brought me up sold me to a certain Rhoda, after many years I met her again, and began to love her as a sister. 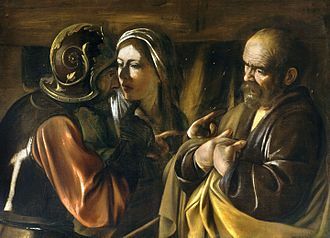 As Hermas was on the road to Cumae, he had a vision of Rhoda and she told him that she was his accuser in heaven, on account of an unchaste thought the narrator had once had concerning her, though only in passing. He was to pray for forgiveness for himself and all his house. He is consoled by a vision of the Church in the form of a woman and helpless from the sins of the faithful. 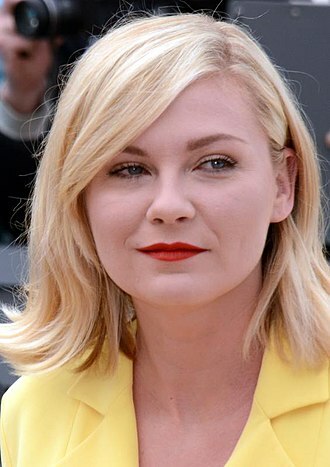 Subsequently he sees her made younger through penance, yet wrinkled and with hair, again, as quite young but still with white hair. 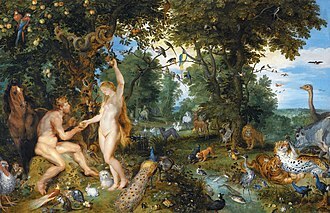 This allegorical language continues through the parts of the work. In the second vision she gives Hermas a book, which she takes back in order to add to it. The fifth vision, which is represented as taking place 20 days after the fourth, introduces the Angel of repentance in the guise of a shepherd and he delivers to Hermas a series of precepts, which form an interesting development of early Christian ethics. One point which deserves mention is the assertion of a husbands obligation to take back an adulterous wife on her repentance. 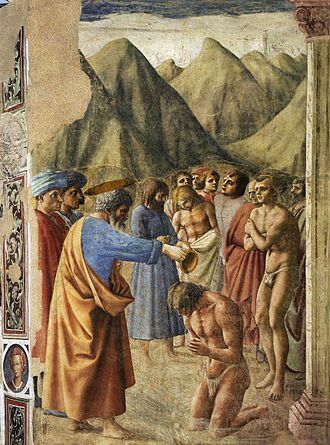 The eleventh mandate, on humility, is concerned with false prophets who desire to occupy the first seats, some have seen here a reference to Marcion, who came to Rome c.140 and desired to be admitted among the priests. 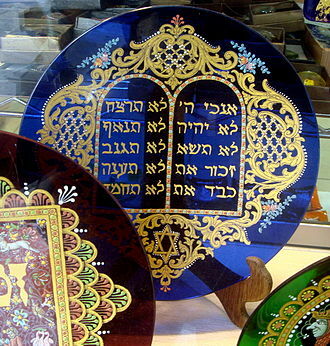 The Ten Commandments, known as the Decalogue, are a set of biblical principles relating to ethics and worship, which play a fundamental role in Judaism and Islam. 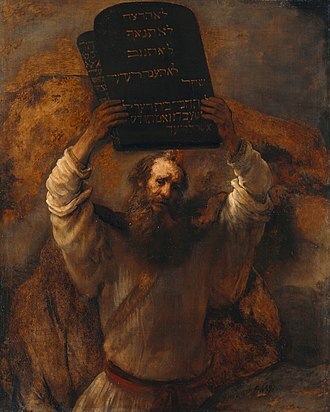 Different religious groups follow different traditions for interpreting and numbering them, the Ten Commandments are listed twice in the Hebrew Bible, first at Exodus 20, 1–17, and at Deuteronomy 5, 6–21. Both versions state that God inscribed them on two tablets, which he gave to Moses on Mount Sinai. 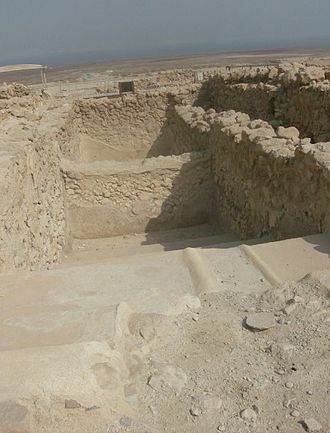 Modern scholarship has found likely influences in Hittite and Mesopotamian laws and treaties, but is divided over exactly when the Ten Commandments were written and who wrote them. 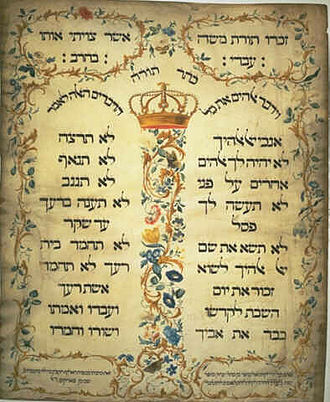 In biblical Hebrew, the Ten Commandments are called עשרת הדברים‎ and in Rabbinical Hebrew עשרת הדברות‎, the Tyndale and Coverdale English translations used ten verses. 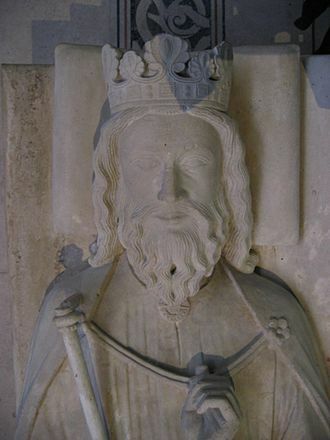 The Geneva Bible used tenne commandements, which was followed by the Bishops Bible, Most major English versions use commandments. 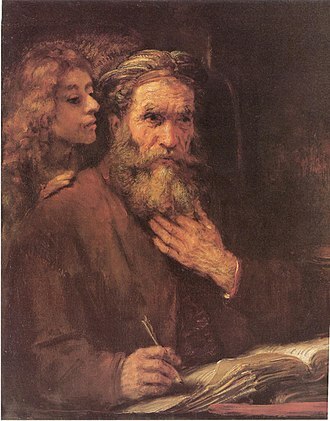 The stone tablets, as opposed to the commandments inscribed on them, are called לוחות הברית‎, Luchot HaBrit, the biblical narrative of the revelation at Sinai begins in Exodus 19 after the arrival of the children of Israel at Mount Sinai. The people were afraid to hear more and moved afar off, and Moses responded with Fear not. And the LORD said unto Moses, Come up to me into the mount, and be there, and I will give thee tablets of stone, and a law, and commandments which I have written, that thou mayest teach them. 13 And Moses rose up, and his minister Joshua, the mount was covered by the cloud for six days, and on the seventh day Moses went into the midst of the cloud and was in the mount forty days and forty nights. The passages in Exodus 20 and Deuteronomy 5 contain more than ten imperative statements, different religious traditions divide the seventeen verses of Exodus 20, 1–17 and their parallels at Deuteronomy 5, 4–21 into ten commandments or sayings in different ways, shown in the table below. Some suggest that the ten is a choice to aid memorization rather than a matter of theology. Traditions, LXX, generally followed by Orthodox Christians, P, same as the Septuagint, but with the prohibitions on killing and adultery reversed. Sacred mysteries are the areas of supernatural phenomena associated with a divinity or a religious ideology. Beliefs of the religion which are public knowledge but cannot be explained by normal rational or scientific means. Mysticism may be defined as an area of philosophical or religious thought which focuses on mysteries in the first sense above, a mystagogue or hierophant is a holder and teacher of secret knowledge in the second sense above. In some, parts of the doctrine were apparently known to priests. They included the Eleusinian Mysteries, the Cult of Isis, the Cult of Sol Invictus, Mystery traditions were popular in ancient Greece and during the height of the Roman Empire, and as discussed below, parts of Early Christianity used secrecy in the same way. Although the term is not used equally by all Christian traditions, to name but a few key examples, these include the nature of the Trinity, the Virgin Birth of Jesus, and the Resurrection of Jesus. These are mysteries in the sense that they cannot be explained or apprehended by reason alone, the word mysterion is used 27 times in the New Testament. It denotes not so much the meaning of the modern English term mystery, in the biblical Greek, the term refers to that which awaits disclosure or interpretation. The position, if not the terminology, of other Christian churches is essentially the same, as the Age of Persecution ended, the secrecy was gradually relaxed. But the term continued to be used, and the word is used in the Eastern Orthodox churches to describe mysteries. Hence Pope Paul VIs papal encyclical of 3 September 1965 on the Eucharist was titled, from its opening words, in the Roman Rite Catholic Mass within or immediately after the formula of consecration of the wine, the celebrant says Let us proclaim the mystery of faith. 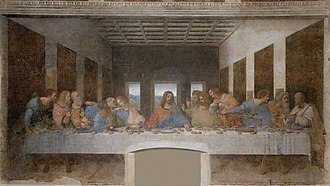 The term is used in Eastern Christianity to refer to what the Western Church currently calls Sacraments and Sacramentals, for instance, the Council of Trent declared there to be exactly seven sacraments. The Eastern Churches, in contrast, have never defined the Mysteries in such precise terms, though the Western Church teaches that the consecrated bread and wine of the Eucharist are one Sacrament, the Divine Liturgy refers to the Eucharist as the Mysteries, in the plural. Absolution is a traditional theological term for the forgiveness experienced in the Sacrament of Penance. This concept is found in the Roman Catholic Church, as well as the Eastern Orthodox churches, Absolution is an integral part of the Sacrament of Penance, in Roman Catholicism. 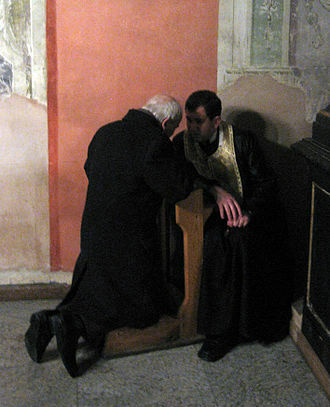 The penitent makes a confession of all mortal sins to a priest. The priest assigns a penance and imparts absolution in the name of the Trinity, on behalf of Christ Himself, using a fixed sacramental formula. 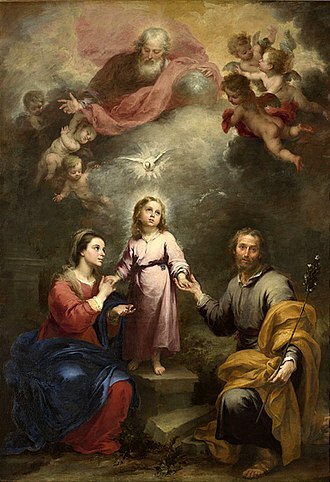 The traditional formula is, Dominus noster Jesus Christus te absolvat, ego te absolvo a peccatis tuis in nomine Patris, et Filii, + et Spiritus Sancti. May our Lord Jesus Christ absolve you, and by His authority I absolve you from every bond of excommunication and interdict, so far as my power allows and your needs require. Thereupon, I absolve you from your sins in the name of the Father, et ego te absolvo a peccatis tuis in nomine Patris, et Filii, + et Spiritus Sancti. The essential part of the formula are, I absolve you and this formula is preceded by other short prayers similar to those used at Mass after the Confiteor. Suspension, in the context of the formula for absolution, refers to a penalty which can be incurred only by clerics, therefore. This prayer shows the concepts of merit and the Communion of Saints in the context of grace as understood in Catholic theology. The diocesan bishop must give permission before general absolution may be given under this circumstance. It is important to note that the occurrence of a number of penitents. The second circumstance is thus envisaged more for mission territories where priests may visit certain villages only a few times a year, anyone receiving general absolution is required to make a complete, individual confession to a priest as soon as possible before receiving general absolution again. An historical example is the absolution given by Fr, william Corby to the Irish Brigade during the Battle of Gettysburg in 1863. The French form absoute is used in English for the absolution of the dead, the absolution of the dead does not forgive sins or confer the sacramental absolution of the Sacrament of Penance. Hell, in many mythological and religious traditions, is a place of torment and punishment in an afterlife. Religions with a divine history often depict hells as eternal destinations while Religions with a cyclic history often depict a hell as an intermediary period between incarnations. Typically these traditions locate hell in another dimension or under the Earths surface, other afterlife destinations include Heaven, Purgatory and Limbo. Hell is sometimes portrayed as populated with demons who torment those dwelling there, many are ruled by a death god such as Nergal, Hel, Enma or Satan. 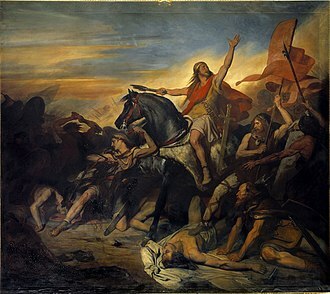 Subsequently, the word was used to transfer a pagan concept to Christian theology, Some have theorized that English word hell is derived from Old Norse hel. 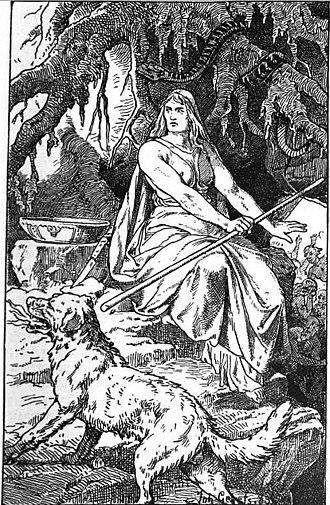 However, this is unlikely as hel appears in Old English before the Viking invasions. 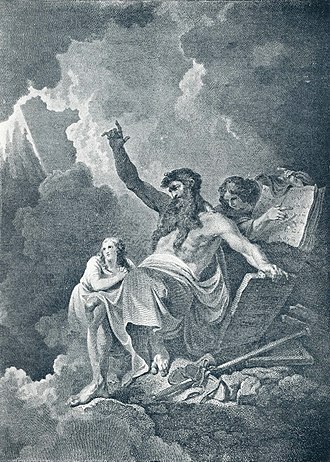 Furthermore, the word has cognates in all the other Germanic languages and has a Proto-Germanic origin, Hell appears in several mythologies and religions. It is commonly inhabited by demons and the souls of dead people, a fable about hell which recurs in folklore across several cultures is the allegory of the long spoons. Hell is often depicted in art and literature, perhaps most famously in Dantes Divine Comedy, punishment in Hell typically corresponds to sins committed during life. In many religious cultures, including Christianity and Islam, Hell is often depicted as fiery and harsh, despite these common depictions of Hell as a place of fire, some other traditions portray Hell as cold. Buddhist - and particularly Tibetan Buddhist - descriptions of hell feature a number of hot. Among Christian descriptions Dantes Inferno portrays the innermost circle of Hell as a lake of blood. At death a person faced judgment by a tribunal of forty-two divine judges, if they had led a life in conformance with the precepts of the Goddess Maat, who represented truth and right living, the person was welcomed into the Two Fields. If found guilty the person was thrown to a devourer and would be condemned to the lake of fire, the person taken by the devourer is subject first to terrifying punishment and annihilated. These depictions of punishment may have influenced medieval perceptions of the inferno in hell via early Christian, purification for those considered justified appears in the descriptions of Flame Island, where humans experience the triumph over evil and rebirth. In Christian theology, contrition or contriteness is repentance for sins one has committed. The remorseful person is said to be contrite, a central concept in much of Christianity, contrition is regarded as the first step, through Christ, towards reconciliation with God. It consists of repentance for all sins, a desire for God over sin. It is widely referred to throughout The Bible, e. g. Ezekiel 33,11, Psalms 6, 7ff, Psalm 51, 1-12, Luke 13,5, Luke 18, 9-13, and the well-known parable of the prodigal son. The Council of Trent defined contrition as sorrow of soul, and this hatred of sin may arise from various motives, may be prompted by various causes. It is known as animi cruciatus and compunctio cordis, the word contrition implies a breaking of something that has become hardened. 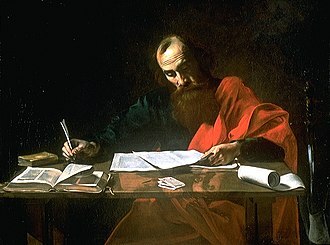 The early Christian writers in speaking of the nature of contrition sometimes insist on the feeling of sorrow, augustine includes both when writing, Compunctus corde non solet dici nisi stimulus peccatorum in dolore pœnitendi. 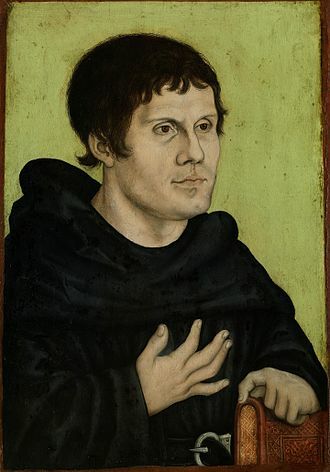 Nearly all the medieval theologians hold that contrition is based principally on the detestation of sin and this detestation presupposes a knowledge of the heinousness of sin, and this knowledge begets sorrow and pain of soul. A sin is committed by the consent, so it is blotted out by the dissent of the rational will, hence contrition is essentially sorrow. But it should be noted that sorrow has a twofold signification--dissent of the will and the consequent feeling, the former is of the essence of contrition, the latter is its effect. The formal doctrine of the Church, announced through the Council of Trent, contrition is the first and indispensable condition for pardon. 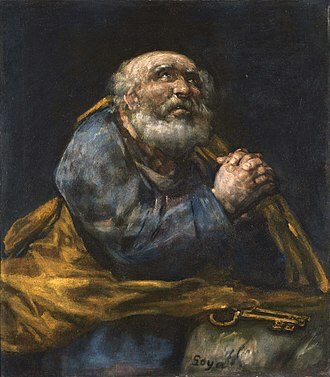 While it is possible for one to receive pardon where confession is impossible, according to the Catholic Encyclopedia, Catholic writers have always insisted that such necessity arises from the very nature of repentance as well as from the positive command of God. 32, Do penance in full, give proof of the sorrow that comes from a grieving and lamenting soul and they who do away with repentance for sin, close the door to satisfaction. 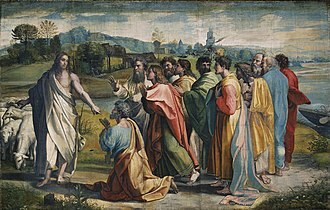 Raphael, Christ's Charge to Peter, 1515. William de Brailes, Christ Appears at Lake Tiberias, c. 1250.